Heights Park Neighborhood in the News! Our neighborhood association president was on the local NBC news talking about our neighborhood! 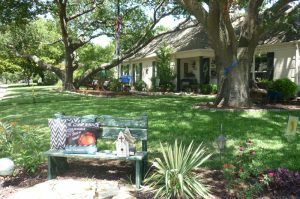 August 2016 Yard of the Month! Thank you very much for the yard of the month selection for August. The real winners are the two glorious red oaks in the front yard. They are the showstoppers and are a pivotal reason we love this home and neighborhood. My husband and I have worked very hard to improve and evolve the beautiful existing landscaping and to create visual focal points throughout the front mulch beds. If an area was struggling for grass, we re-purposed it. Most of our accessories (benches, wheelbarrow, etc.) were items we found set out for trash. I love taking discarded items and using them as planters or in other visually pleasing ways. My husband built our front yard deck and the Adirondack chairs provide a great area to relax in the shade. We have built and bordered three separate planting areas in the past year and we are still working to design and fill them. We both work demanding full time jobs and are very busy with our young children but we take pride in doing all the yard mowing, maintenance, gardening and landscape design ourselves. It’s a work ethic and attitude that we hope to instill in our children. We are very grateful for this little piece of land do not ever take it for granted. Thank you for appreciating our efforts.